Ferrari will make 499 examples of the new LaFerrari. Ha! Jalopnik readers know ten limited-run supercars that make it look as common as a Camry. With so many absurd and failed supercar companies out there, we're sure you can think of more insane limited-run vehicles than this. How could we have left out something like the Isdera? Well, we just didn't have space. Leave us your favorite limited-run supercar in Kinja below and help fill out this short ten-point list. Remember, though. No car with a production of more than 25 examples is allowed into this elite club. Only three of these limited edition 1,018 horsepower CCXRs were ever built. It also has "millions of silvery white diamonds infused inside the visible carbon fiber weave bodywork." One got abandoned in Switzerland for some reason. It's hard for us to say how much we love the idea of a superfast Nissan GT-R drivertrain stuffed into a pedestrian Nissan Juke. Only 20-25 of these things will be made. While the Lamborghini Veneno is still making the headlines for its stealth fighter-meets Le Mans prototype looks, the Sesto Elemento still stands up as one crazy feat of supercar engineering. It has a mere 570 horsepower, but thanks to oodles of carbon fiber, it weighs just 999 kilos (2,200 lbs). Only 20 are being built. You know you have something special when Lamborghini rejects your supercar design for being too crazy. That's what happened with this V16 turbocharged car built by a bunch of ex-Lambo engineers. Only 11 were made. There were many, many homologation specials we wanted to put on this list, from the road-going Porsche 917K to the sole Toyota GT-One. 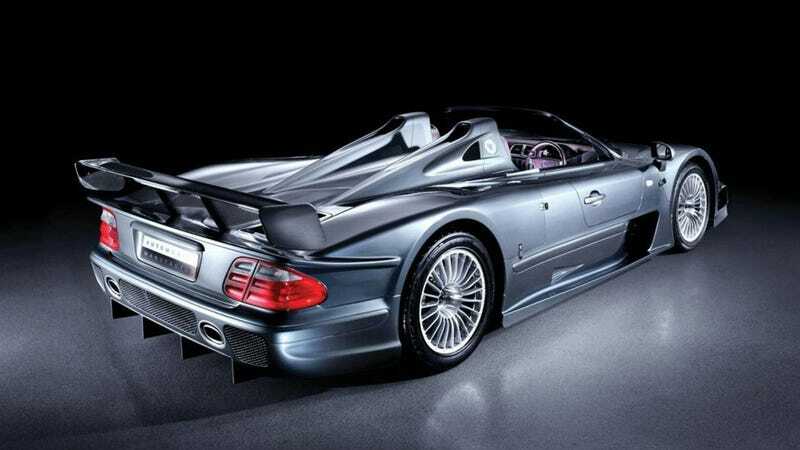 The craziest of all was Mercedes' CLK-GTR roadster. The regular CLK-GTR was absurd enough, and there was really zero reason for them to chop the top, other than to be nuts. Six were made. The ultimate evolution of the spaceship-on-wheels Zonda was the Zonda R, right? Nope, they made a single road-going version called the 760RS. And they gave it extra power just to be sure. They also made a second 'LH' version (above) for Lewis Hamilton in purple. We will never cease to profess our love for America's craziest supercar venture, which has been not building cars for decades now. Every so often a real car creeps out of the factory. We believe that number sits at 17 for the twin-turbo, 625 horsepower W8. It takes a lot to be noticed when you're a newcomer to the supercar game. Spain's Tramontana opted for a tandem two-seater look, which worked, we suppose. Production was limited to 12 a year back in 2009, but we're not sure if even that many were ever made. You might be surprised to hear that only two copies of this six-wheeled, 200 mph (claimed), Cadillac V8-powered British supercar was ever built. Oh wait, no? You're not surprised? Neither are we. Starting in '92 only five of these things were made. The Mega Track was a four-wheel drive supercar with a 394-horsepower Mercedes V12 and 8-13 inches of ride height. Say it one more time: off-road supercar! How did this not catch on?